The Greensboro Science Center is a non-profit organization located in scenic Greensboro, North Carolina. The center was founded in 1957 as a part of a movement by the local Parks and Recreation Department. It and was initially known as The Greensboro Junior Museum until 1989, when the local Greensboro Science Center entered into a partnership with the city of Greensboro and officially founded the Greensboro Science Center. The mission of the Greensboro Science Center is to foster education, curiosity, and exploration of the natural sciences through a dynamic family-focused program. 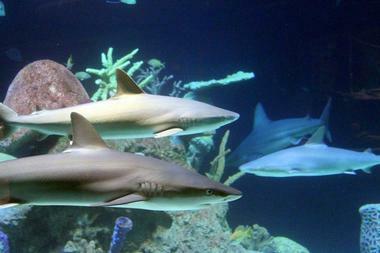 The center achieves this mission through a unique triad of attractions including: a zoo, an aquarium, and a museum. There are also a wide variety of educational programs, specialized field trips, and workshops for children in the community to partake in. The Greensboro Science Center is currently undergoing expansions and upgrades towards the completion of its “Master Plan”. The plan is expected to be completed by the year 2020 and will feature a world-class science museum, a high-tech OmniSphere Theater, and even new expansions to the zoo and aquarium. The Greensboro Science Center Museum has a world-class variety of exhibits and interactive exhibits to explore. Visitors will find an endless supply of adventure and educational displays to enjoy. The OmniSphere Theater is also part of the museum and offers a variety of educational and exciting films for the entire family. This total immersion theater brings science to life with aw-inspiring films. The museum portion of the Greensboro Science Center provides a fascinating hands-on experience that features a variety of attractions and exhibits. The first exhibit, Prehistoric Passages, contains all sorts of fossils, skeletons, and dinosaur footprints. Aspiring paleontologists can see artifacts made of petrified wood and amber from millions of years ago. 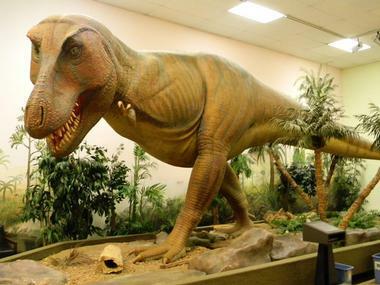 Visitors can even get up close and personal with a giant Tyrannosaurus Rex replica. An educational exhibit entitled, Healthquest¸ allows visitors to explore the functions of the human body. Interactive displays allows visitors to see how decisions they make can cause specific changes to the body and its main systems. The Greensboro Science Center Extreme Weather Gallery allows visitors to experience everything from hail to snow to a Category 5 hurricane up close and personal. Visitors can even feel the force of a tornado and gran lightning with their bare hands. This exhibit is sure to excite and educate alike. There is plenty more to see and do at the Greensboro Science Center Museum, including Bone Zone, Herpetarium, Collector's Corner, Sciplay Bay, Herpetology Lab, and Aquatic Discovery. · The Bone Zone – This exhibit features information on animals with vertebrae from all over the animal kingdom. · Herpetarium at the Greensboro Science Center – This exhibit features all sorts of venomous reptiles and unusual amphibians. · The Collector's Corner – The museum curator has put all sorts of pieces on display, everything from old electronics to magnificent underwater treasures. · Sciplay Bay – The S.S. Curiosity sets sail in this exhibit, visitors will be able to explore the sea and then spend some time on the beach building forts and flying kites. · Herpetology Lab at the Greensboro Science Center – This lab allows visitors to touch the reptiles and amphibians with the help of friendly docents. · Aquatic Discovery at the Greensboro Science Center – This exhibit has all kinds of animals on display, such as alligators, turtles, snakes, and more. This portion of the Greensboro Science Center provides visitors with interactive experiences with all sorts of animals. There are daily zoo keeper talks as well as friendly farm feedings for guests to partake in. There are plenty of different animals to see in the zoo's variety of exhibits including: Crocodilian Cove, Scentsational Species, Monkey Business, Wallaby Walkthrough, and Hidden Hunters. There is also a Discovery Center where trained docents help visitors play with small and friendly animals. Visitors can not only see and play with animals in the zoo, they can expect to learn multitudes about their lives and habitats. 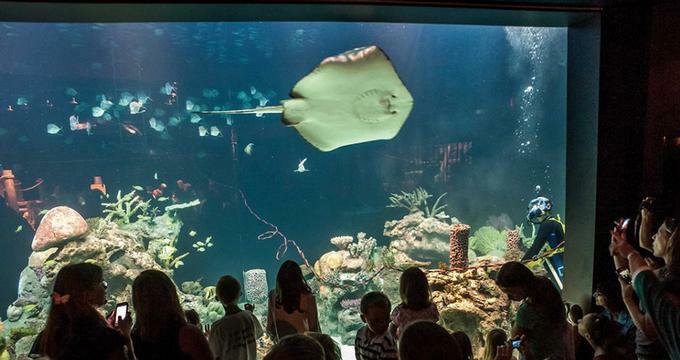 The Carolina SciQuarium is a 22,000 square foot state-of-the-art complex ad is the first of its kind in North Carolina. It cost $32 million and was opened to the public in June 2013 as part of the master plan. The aquarium portion of the Greensboro Science Center features a world-class collection of animals including: African Penguins, Sharks, Otters, a Fishing Cat, Stingrays, Moray Eels, an Anaconda, Golden Lion Tamarins, and Mata-Mata Turtles. Visitors can even have behind-the-scenes educational experiences to truly be immersed in the life of these rare and beautiful sea creatures. 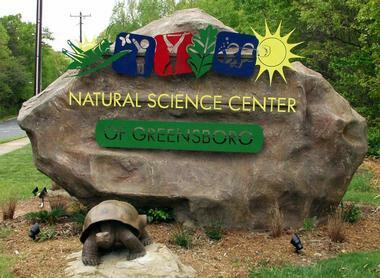 The Greensboro Science Center offers a variety of tours, group rates, and field trip options for visitors. There is a fascinating gift shop as well as a café for visitors to enjoy. There is a nearby park with covered patios for visitors to enjoy their packed lunches or snacks. Parking is free and the entrance fee covers entrance to all three parts of the science center (museum, zoo, and aquarium). Be sure to double-check the hours of operation of each part of the science center and keep weather issues in mind. SkyWild is an exciting program that allows visitors to be fully immersed in the wild and experience a variety of animal behaviors while obtaining a great workout. There are all sorts of challenges that force participants to get creative and imitate animal actions to get through. Anyone healthy enough can participate (if under 18, a parent or guardian must sign a waiver), be ready to waddle, crawl, and leap while gaining a greater appreciation and understanding of the diversity of life. From summer camps to animal outreach programs, the Greensboro Science Center is very involved with the local community. Upon request, the center will bring exciting animals directly to your school, church, camp, or child care facility. These live and exciting presentations are very educational and enjoyable for people of all ages. There are also public shows offered on weekends the center's adventure theater. All sorts of special events and even laser shows are also hosted by the center for the enjoyment and education of the public.